As the curtains opened on a new school year, mentors and teens in the East Cobb-based Opportunity Knocks for Youth program took to the stage to demonstrate some of the adjectives often heard when focusing on success; responsibility, attitude, organization, respect, listening, etc. The first monthly meeting of the year kicked off on August 9 at Mt Bethel UMC with dinner and impromptu skits showcasing both qualities and skills of successful people. 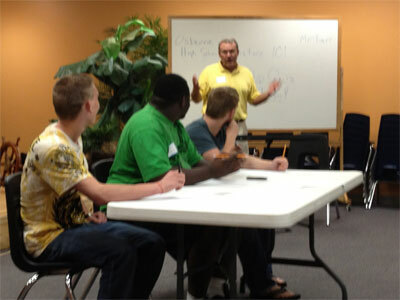 “Laughter is a great equalizer when adults work with teens,” said OK for Youth Executive Director Dale Champion. “During the presentations we saw some acting talent coming out in our teens,” he said. “But the laughter brought on when mentors took the roles of bored kids with bad attitudes just brought the house down.” Kids and mentors were given 15 minutes to create skits that showcased two qualities. The rest of the group guessed which qualities the performers were demonstrating. “The cooperation between the teens and their mentors to create a great skit in a short time was just what we were hoping for,” Champion said. He believes that mentor relationships are the most significant part of the nine-year-old program. Spell is one of more than 20 men and women who work with Cobb County foster teens living in group homes through this volunteer program which aims to bring a new perspective on education and responsibility to these special teens through personal relationships. “Our volunteers offer one-on-one support to at-risk teens by focusing on personal responsibility, positive attitudes, financial literacy, conflict management, and giving back,” said Champion. The program partners with Cobb County Department of Family and Children Services, Mt. Bethel United Methodist Church and Cobb County schools to provide an innovative approach to support at-risk youth. The teens, with mentors at their sides, take part in educational, cultural and career-related activities, which provide new perspectives and insight. “Less than 30% of foster children are graduating from high school,” Champion said. “This year OK4Youth participants celebrated a 75% graduation rate with some already pursuing higher education.” Preparation for the workforce is another objective of the program when higher education is not the young person’s choice.